Looking for a great place to hold your next meeting, conference, wedding, anniversary, birthday or other event? 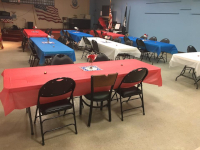 Many American Legion Posts have rental spaces available at reasonable rates. Use the map and listing below to find a local American Legion Post in your area that has rental facilities available. Northern Virginia’s best kept secret. The Patriot Hall is a full-service venue, meaning we offer everything you need to host a beautiful and unforgettable wedding or special event. Whether you are looking for a specific flower arrangement or customizable menu options, we’ve got you covered. For any special requests you might have, we’ve got the services and connections around Vienna to make them happen. 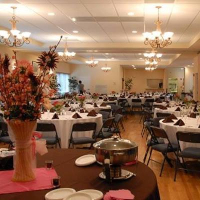 Our rental Hall is the perfect venue for your corporate meeting, organization seminar, birthday party, bridal or baby showers, wedding and anniversary receptions, classes, town halls, celebratory dinners, events, and many other functions. With over 1800 square feet of available space and a capacity for 100+ persons, it can be easily configured for many different event types. With 3000 square feet of available space and a capacity for 172 persons, it can be easily configured for many different event types. Full service kitchen available but you can have catering if you wish. We have beer and wine or you can BYOB. Stage for a band or DJ, dance floor. Pool and shuffle board tables. Outdoor patio for fresh air. No smoking inside. Additions can be submitted by Post Commanders, Post Adjutants, or Post Media and Communication Chairs by submitting the Rental Hall Information Form below. Submit the form and a photo (if desired) to the Media Help Desk email address on the form. Corrections to information should be submitted by an authorized Post contact using the Media Help Desk email address on the form.